Drew Estate has once again teamed with the Van Winkles for a new cigar blend – Pappy Van Winkle Tradition. The cigar features an Ecuadorian Habano Oscuro wrapper, Indonesian Binder and aged fillers from Nicaragua and the Dominican Republic. 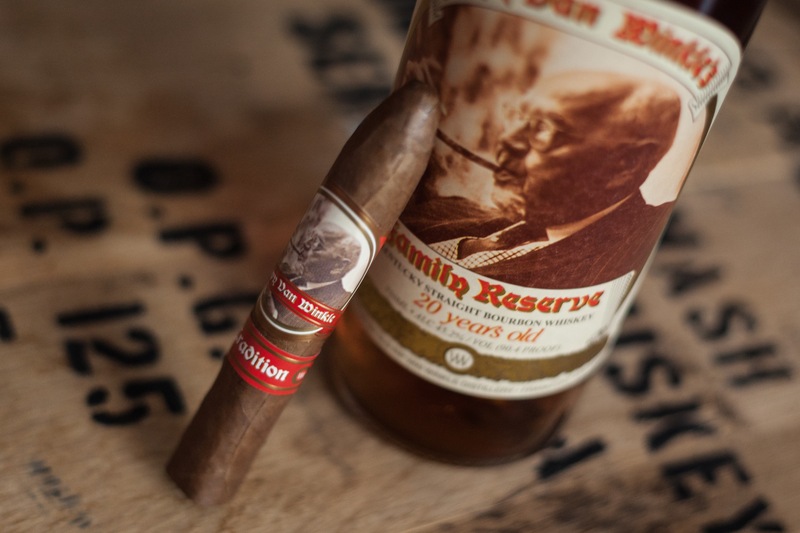 As its name implies, the cigar is traditionally made, especially when compared to the previously released Pappy Van Winkle Barrel Fermented cigar. Where that cigar is available only through Pappy & Company, the new Tradition has a limited availability at Drew Diplomat retailers. Tradition wasn’t initially blended for this collaboration. Years ago when blender Willy Herrera was in talks to join the Drew Estate Family, he put together three cigar blends. One of those blends was especially loved by everyone within the company who smoked it. In 2016, when Jonathan Drew handed Julian Van Winkle a box of cigars featuring this blend, Van Winkle was mesmerized with the blend. With that, Pappy Van Winkle Tradition was born. As I took the Belicoso Fino from its wrapper, aromas of aged tobacco, vanilla and molasses hit me. It has a great draw and features hints of cedar, molasses, raisin and vanilla, as well as a bit of spice and slight earthiness. There wasn’t a great deal of further development the more I smoked, which was okay by me. The flavors presented were delightful. I generally lean towards medium-bodied cigars, and Pappy Van Winkle Tradition hit my sweet spot. The well-constructed cigar lasted about 45 minutes or so. The cigar is a little bit on the pricey side, but offers a superb smoke. I highly doubt you’ll be disappointed with your purchase. Once I had a good idea of how Tradition smoked, I was off to find a great whiskey pairing. I first reached for a bottle of Pappy Van Winkle Family Reserve 20-year-old bourbon. The dark, rich, and refined character that defines the famous whiskey played nice with the medium flavored cigar. The stick’s spicy quality elevated the pairing’s overall experience while not feeling overpowering. I especially liked that the dried fruit notes of the bourbon were enhanced as well. Again, a beautiful pairing. Since PVW 20-year is impossible to find, I also paired the cigar with the slightly easier to obtain Michter’s 10-year-old bourbon. Michter’s sweet cinnamon notes complemented the cigar’s sweeter molasses and vanilla notes. Overall, it was a nice pairing as well. Thanks to Drew Estate for the cigar samples. As always, all thoughts and opinions are my own.